A snack what u want to eat again and again. Mix yeast and sugar in luke warm water; leave for 15 minutes now mix salt,baking powder and yeast in refined flour and knead into dough.Set aside for 4 hours. Knead dough once again and separate it into 2 portions. Grease a pizza dish and set one of the rotis in it. Spread sauce over the roti and make a layer of capsicum,tomato,mushroom,chicken,onions,mozzarella cheese and olives. Put egg on the edges and place the other roti on top. Press it down so that it sets. Brush remaining egg on the roti. 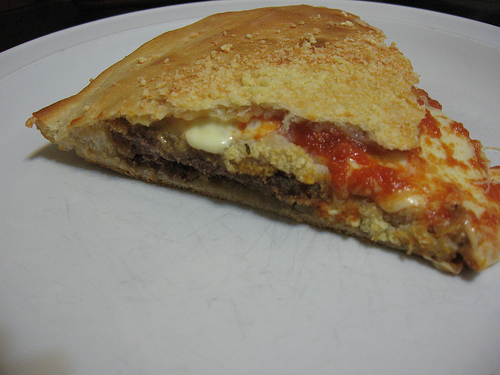 Keep pizza sandwich in a pre heated oven for 15 minutes and then take it out. its a wounderfull snacks & one of my favourite snacks. sounds n looks tempting..!! surely im trying this one. !